I don’t believe I’ve ever seen such an interesting premise so thoroughly ruined. For the second time (the first being Fracture, of course), Megan Miranda had a fantastic idea and just didn’t follow through. When I requested this book, I was pretty sure I would be getting a psychological thriller of some sort, possibly with paranormal elements. But a thriller should be thrilling, right? 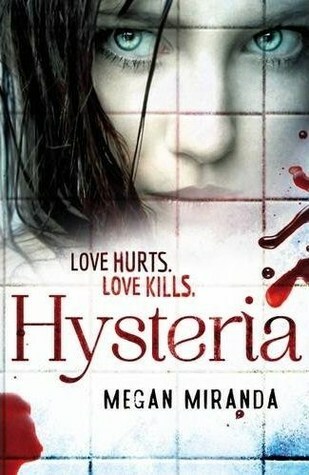 Yeah, Hysteria… not so much. and i so agree i to try to find good things to report for a book i am reviewing but usually that doesn't remain the case. Oh, d'oh. I like the premise of this one and it's always so hard when the story doesn't live up to the blurb. It sounds like a hot mess. Also sounds like the girl should have been in therapy, not packed off to some boarding school where she had no support. Sheesh. Yeah, this was weird. I had never read anything by this author and so i went in blind. It did keep me entertained though, despite the lack of depth in the seondary characters and some unnecessary plot threads. As I predicted reviews all over the place. I just read a 4.5 review and a 5 star review this morning. I had the exact same reaction when I read "Fracture". I was so utterly disappointed with that book that I didn't even bother with this one. So glad I passed up on it. Sorry it brought you down and I really hope your next read will be much better. Sorry you didn't like as much as you wanted. I am not sure that I would be able to connect with Mallory either. I have to relate or like a character to get into a book usually. I felt nearly the same way! I was starting to think I read a different book than everyone, since it seems to be getting 5s and 4.5s from very blog I follow. I just found the whole book lame, and my first problem was that her parents sent her off to boarding school! It makes no sense. Sorry to hear this one didn't live up to its promise! I really like the sound of it, for the same reasons you said at the beginning (unreliable narrator in particular, I've always enjoyed them in books), so it's a shame to hear it fell a bit flat. Hope your next read is better! Ha ha! You finished. You slay me girl. I avoided this one when everyone was buzzing over the cover, I don't know I am just not a fan of boarding school books, I mean really who goes to boarding schools these days? After reading your review I am so glad I didn't get this, I mean making out at a funeral, a girl goes to boarding school a couple of months after stabbing her boyfriend, mean girls.... ugh.... I read Fracture by this author last year and it was just okay. This one is definitely getting mixed reviews so I am steering clear! Hm... don't think this one is for me. I don't think I would like the heroine especially with that attitude. I don't get the being upset for not making out at a funeral. Wha? Nor do I get why the guy would follow her around like a puppy. I can, however, believe she could get a knife. :) I've met very resourceful teens and yea... it's possible. :D I'm sorry you didn't enjoy this one, but it is a brilly review! I completely agree with every single one of your points here. Though I gave this 3 stars in the end. It probably helped that I read this after something worse. I haven't tried Fracture yet myself, but if you weren't a fan of that one either, I'll doubt I'll pick it up. Lovely review, Maja! She did actually stab him!! Why is she just in boarding school? I admit I considered requesting this one on NG but thankfully, because I'm trying to keep my review books down, I'm being extremely fussy and didn't :) Thanks for the informative, honest review Maja. I'm sorry that this was so disappointing for you. Aww Maja, this book sounds like a complete mess, I remember my initial excitement when I first came across this book, but thankfully because of the not so promising reviews I didn't request a copy. It's so annoying when a novel fails to deliver, and this book sounded like it had the potential to go far! Sorry you weren't able to enjoy it, but thanks for your insightful review, I hope there will be a Megan Miranda book for you one day that you will enjoy! Sigh! I'm so sick of books with awesome covers and premises tempting me and then failing me. I will NOT be reading this one! Boo. I have this one from NetGalley, and after hearing so many great things about Fracture (with you being the exception), I was hoping this would turn out to be a bit better. Obviously, I'm still going to read it, but I've definitely got lower expectations now, especially since you and I have such similar tastes in books. I adore a good thriller and an unreliable narrator always adds an extra layer of tension and unease, so I was really looking forward to this one. I'm so disappointed that the thrills and eerie atmosphere were a let down! I don't think even this bizarre sounding romance could salvage this mess for me. I'm definitely skipping this one. Amazing review—thanks for your thoughtful honesty! Ha! Sometimes finishing a book is a sign that it was bad, but not so bad that you wanted to throw it across the room. This sounds like any other paranormal/contemp YA involving a boarding school and a hot boy who just happens to notice the MC. I think after this I’ve officially written Miranda off of my “to-buy” list. I wasn’t a big fan of Fracture at all, and Hysteria hasn’t gotten ANY good reviews (that I’ve read). I’m sorry that you didn’t like this one, though, Maja. It’s never fun to read a book you don’t enjoy. Oh thank goodness you read this one to save me from it, Maja. I was REALLY disappointed in Fracture, and specifically didn't request Hysteria because of that disappointment. Yes, the concept again sounded awesome, but I had serious doubts as to Miranda's ability to pull it off. Ugh, Mallory sounds horrid and the whole plot just sounds so done and unbelievable. This doesn't sound like a book I'd enjoy. A thriller not being thrilling? A girl throwing herself at a guy who's dad just died? Wow... This sounds like a car crash. Great review, Maja and I'll be staying away from this one. Thanks for the heads up. "As a general rule, I try to find something nice to say about each and every book I bother to review, but Megan Miranda didn’t make that job easy at all. The best I can say is that I finished it, which I suppose isn’t much." Lol! I know Sam didn't like this much either and so will pass on this. Unlikeable heroines, a romantic lead who resembles a lost puppy, mean girls ... there are just too many things in this one that I try to avoid having in my novels. Great review, Maja! So I'm reading this one right now (about 78% through it, actually) and was curious what others thought about it.. I must say I'm surprised to see that most of the people actually seem to have enjoyed it. Which is such a huge surprise to me, as I am seriously annoyed by this book. The plot is all over the place, the character doesn't inspire sympathy at all, and most of all - like you pointed out in your review - this book really isn't thrilling at all. I fell asleep twice while reading it. Thanks for your honest review, I'm glad I'm not the only one not impressed by this book, I was starting to think that maybe I missed something there..